Hanukkah is less than one month away. Yup, it starts at sundown on Sunday, December 6th, and so it’s time to start crossing people off your gift list. Here are a few of my favorite food-related finds for every friend and family member. After all, almost everyone loves a food-related gift. It’s hard to go wrong with a present you can eat. Here are some of my favorite new finds for your Hanukkah noshing. I guess someone decided that dinosaurs and Hanukkah just go together, and I feel pretty good about that. Try one of these adorably kitschy dinosaur gifts for someone special (like me). I love dinosaurs. I am a total sucker for cute mugs. And since I am also a big klutz and likely to break them almost weekly, I am always stocking up. Here are a few of my favorites for the season. As a food writer and blogger, I get sent every cookbook under the sun: the good, the bad and the boring. But these three cookbooks are the ones that have me drooling and bookmarking up a storm. Share them with the cookbook lover in your life this season. Whether it’s for your surly teenager, husband or that new chubby baby, it’s a scientific fact: everyone looks good wearing some matzah ball gear. Love Jewish food? Sign up for our weekly Nosher recipe newsletter! Pronounced: KHAH-nuh-kah, also ha-new-KAH, an eight-day festival commemorating the Maccabees’ victory over the Greeks and subsequent rededication of the temple. Falls in the Hebrew month of Kislev, which usually corresponds with December. 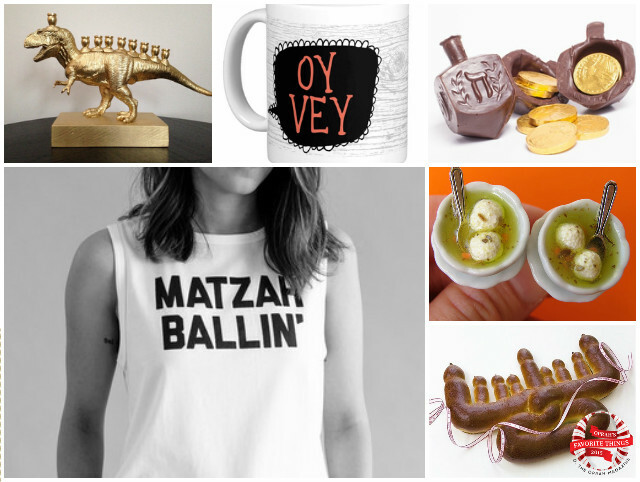 Delicious and fun gifts for the Jewish cook in your life.